Treat the face and body to AHAVA's Moisturizing Salt Soap. 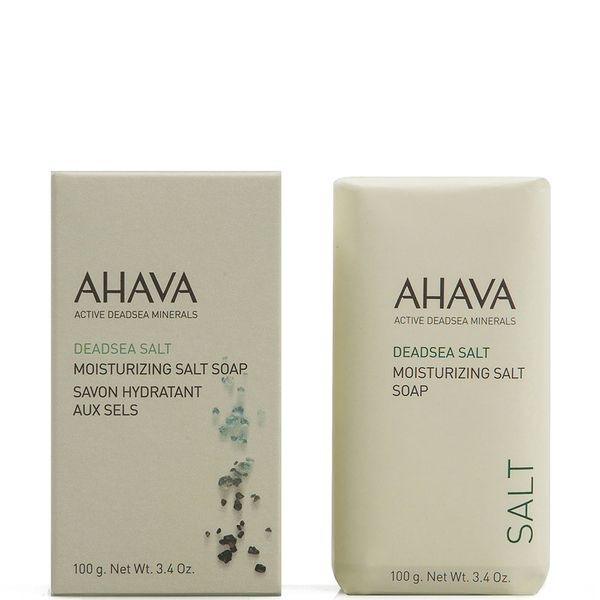 Infused with Dead Sea Salts, the soapless bar creates a luxurious lather upon contact; gently washing away dirt and impurities, whilst restoring the skin's natural pH balance. Skin is soft, smooth and delicately cleansed. Pottasium Lauryl Sulfate, Disodium Lauryl Sulfosuccinate, Corn (Zea Mays) Starch, Cetearyl Alcohol, Stearic acid, Aqua (Water), Sodiumchlorid, Sodium Sulfate, Citric Acid, Titanium Dioxide, Magnesiumcarbonat, Maris Sal (Dead Sea Salt), Parfum (Fragrance).